The fermentation is a biochemical process that is carried out by different bacteria, yeasts and moulds, used to transform the different food substances. Among them, there is beer. The fermentation of beer takes place thanks to the action of particular unicellular mushrooms, the Saccharomyces cerevisiae and the Saccharomyces pastorianus, that act on the sugars of the malt essential to prepare beer, both it is a barley malt and other cereals. These two different mushrooms, called yeasts are not interchangeable, but create different types of beers. In particular, Saccharomyces cerevisiae is the one that allow the production of high fermentation beer (Ale beer), whereas Saccharomyces pastorianus (aka Saccharomyces carlsbergensis) allow the production of the most common beers like Lager and the other low fermentation beers. The words high and low fermentation show the temperature of the biochemical process, but also the fact that, during the fermentation itself, the yeasts remain in the surface (in the high fermentation) or they go on the bottom (in the low fermentation). During the process of production of beer, the fermentation takes place within 24-36 hours, according to the initial conditions of the temperatures of the type of malt and it lasts for 7-10 days. Rarely, the fermentation lasts always the same period of time, also if they use always the same ingredients and the same quantities, because there are different conditions that modify the period of timer. Naturally, the period of time can vary according to different types of must. A more practical way to be sure that the fermentation is finishes, is to measure the density of the beer with the dedicated tools. 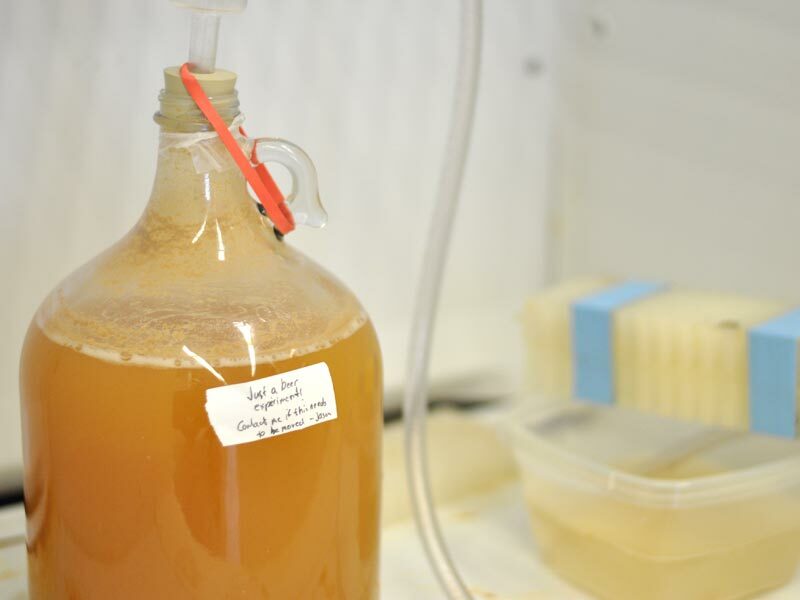 A beer, which density is a quarter of the initial one, has finished the phase of fermentation. Nevertheless, it is possible, for instance in the high fermentation beers, to have different values of density. Some beers, once finished the fermentation, start the second fermenation, to remove the exhausted yeasts and introducing the new yeasts. The second fermentation happens in a new fermenter or directly in the bottle. The fermentation is a complicated process, that foresees the scission of the sugars thanks to the action of the yeast, it has times and characteristics that depends on a series of parameters. Usually, it happens in two phases. A first phase called “forced” and another phase called “growth”. During the forced phase, the inoculated yeast uses its reserve of energy to create some enzymes that will increase the volume of the must. In this phase, a series of reactions will lead to a variation of the quantity of oxygen, sugar and amino acids. This first phase last for a small period of time, and then the “growth” starts, this is the phase when the yeast starts its reproduction and the increasing of the volume. According to the quality of the yeast and the must, the volume can triplicate. As a consequence, be sure that the fermentation is finished, before bottling the beer: on the contrary, the bottle could explode or create the “spumante effect” once that it is uncorked!